If you are an experienced traveler to Eastern Europe or Latin America, you might wish to stay in an apartment while you are visiting the special lady you meet through our service. A Foreign Affair offers very comfortable, reasonably priced accommodations during your stay. These apartments are located in four of our tour cities. In Russia, we have four St. Petersburg apartments are available. These apartments are located some of the most exclusive areas of St Petersburg. You will be able to see all St Petersburg has to offer with that special woman you have traveled to visit. This apartment, located in downtown St. Petersburg, offers all the comforts of home, and is convienent to all the cultural attractions this magnificient city has to offer. The world famous Hermitage Museum is located a short distance away and the Metro can take you to any point in St. Petersburg. As you can see by the photographs, this St Petersburg apartment offers very comfortable surroundings. It includes a king sized bed, sofa, armchairs, color TV , and telephone. The Kitchen area contains a refrigerator, microwave, pots, and pans. The bathroon amenities consist of a shower, sink, and toilet. An iron, ironing board, and washing machine are also available for your convienence. 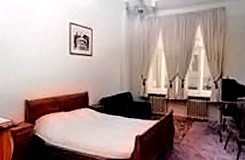 This is another convienently located, very comfortable apartment that is close to all St. Petersburg's attractions. It includes a king size bed, sofa, color TV, and telephone. The kitchen area includes eating and cooking utensils, microwave, and refrigerator. Apartment at Crossroads of Nevskiy pr. Located in one of the liveliest areas of St. Petersburg, this neighborhood has many resturants which offer numerous culinary delights. This apartment is a step above standard St. Petersburg apartments. It has been remodeled to European standards and offers a great view of “Old Nevsky”. This large 2 bedroom apartment includes a comfortable sofa, chairs, dining room table, color TV, telephone, and answering machine. Both bedrooms include a full size bed, dresser, table,and linens. Both bedrooms have a private bathroom which contains a toilet, sink, tub, and shower. Also, the full kitchen which includes everything one would need to create any meal includes an oven and stove. The apartment also includes a washing machine, iron, and ironing board. This two room St Petersburg apartment is located in the heart of Nevskiy Prospekt. You will be in walking distance from a great deal of what the city has to offer. Great shopping, sights, and a wide variety of dining options. However, should you feel the need for some comfort food, McDonalds and Kentucky Fried Chicken are close by. 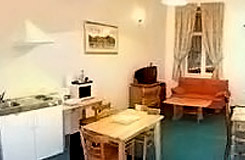 As you can see from the photographs, the apartment is very roomy, with all the space needed to be comfortable. This apartment has an added bonus over our other St Petersburg apartments in that it has satellite TV. If you prefer to stay in occasionally and cook your own meals. the kitchen has all the amenities you will need including: gas stove, oven, dish washer, and refrigerator. The bedroom includes a queens size bed, nightstand, amour, and table. The bathroom contains a full shower, sink, toilet, and washing machine. 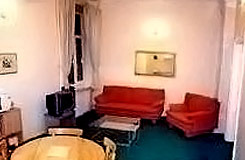 We have one very comfortable apartment flat located in Kiev's Independence Square. This Kiev apartment is perfect for the budget minded visitor. It is a great bargain with all the amenities you need for a enjoyable stay. A comfortable sofa that pulls out into a full sized bed. The apartment also includes a wall cabinet and chairs. Electronic equipment includes a telephone, color TV, VCR, and even a stereo. The kitchen equipment includes everything you need to cook your own meals. (eating utensils, cookware, dishes, gas and microwaves ovens, refrigerator, and a gas stove) The bathroom is very modern. It contains a bath with separate shower, and a private water heater to keep the water warm. Also includes washer, dryer and sink. This two room apartment's living area contains two sofas, easy chair, International TV, telephone, DSL Internet. The bedroom contains a bed with linens. The two room dwelling contains a couch, international TV, telephone, and video game. The bedroom includes bed with linens. The bathroom has a toilet, tub and shower. This deluxe jr suite contains a couch, coffee table, international cable TV, and telephone along with a comfortable bed with linens. For visitors needing a Cartagena Apartment, we offer both luxury and value. The living area contains a couch with comfortable chairs and light cheerful surroundings. The dining area includes a high quality dining room table with matching chairs and a wood cabinet. Beds are very snug. Other amenities include a microwave, dual air conditioning, two TVs, and VCR. Services also include full security, covered parking, and swimming pool on the grounds. If you are traveling in a group of other men it would be a perfect place to rent luxury together, while at the same time ensuring that everyone has their own privacy. This apartment is located only one block from the Cartagena Hilton. It includes 2 bedrooms, 2 bathrooms, and full kitchen with refrigerator, oven, and stove. Amenities include international cable TV, and telephone.